Have you seen Sheena Iyengar on Ted.com? She has a great talk called "How to make choosing easier." At this date there are over 402,000 views of her TED-talk. She concludes, "...four techniques for mitigating the problem of choice overload -- cut -- get rid of the extraneous alternatives; concretize -- make it real; categorize -- we can handle more categories, less choices; condition for complexity. All of these techniques... are designed to help you manage your choices -- better for you, you can use them on yourself, better for the people that you are serving. Because I believe that the key to getting the most from choice is to be choosy about choosing. And the more we're able to be choosy about choosing the better we will be able to practice the art of choosing." 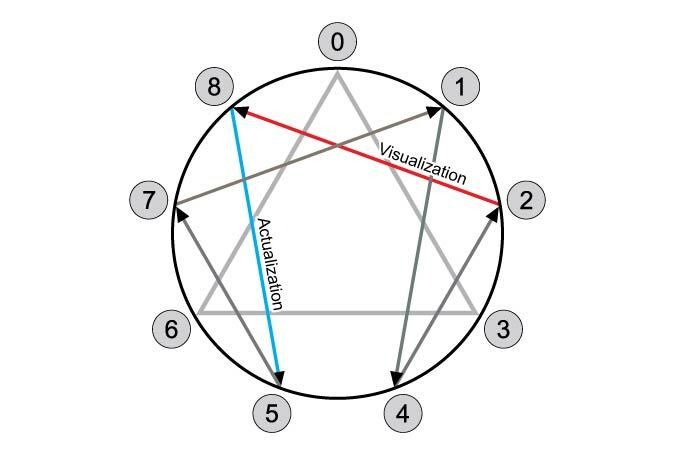 Her research is applicable to the NTS (Nine Term Symbol, enneagram) because it demonstrates that people need to visualize in order to actualize choices. Her research shows that the "choice maker" may understand the products he or she is offering but that the chooser likely does not. The choice maker must give the chooser a chance to see the big picture. When you listen to her speak, keep the enneagram in mind. You may see that the critical aspects of Visualization and Actualization are tied closely to success during the process of choice. This can be applied when you understand the Nine Term Symbol and use it in your business. Those trained in NTS Thinking can see deeply into the interconnectedness within an expert's research or presentation and can quickly root out the core, universal factors. There are complexities and difficulties involved in everything we do these days. The NTS provides a simple way to connect the essential parts of what makes things work and let go of the distractions. In this case, Sheena Iyengar found repeatedly that people, or rather laymen, need a more simple path to selecting a choice and that this simple path must include the time and space for the chooser to visualize, to picture the outcome. Only then would the actualization phase move the process forward with more successful results.